So, I've received quite a few responses regarding the myocarditis that was discovered in Vienne's lab results. Information has been offered to me which has sent me on the hunt for more. I have discovered some devastating facts regarding what is referred to as "a rare, serious, and under diagnosed condition". One follower on this blog used to be a Pediatric RN and thoughtfully wrote to me, privately, willing to offer any information from her own experiences. She said that myocarditis is "the worst kind of illness to me because it has no explanation. No way to prevent it; no way to detect it (in the cases I have seen)". My mom wrote to a friend of hers who is the head of Pediatrics at OHSU, requesting any insight. His response was: "My sense: Vienne had a viral inflammation of her heart. It is in a place that causes dysrhythmias (abnormal heart beats). I suspect her heart stopped or fibrillated from this and that it would have been difficult to resuscitate her even without water and a bathtub involved. This does explain why she didn't struggle. The ED information (lab tests) and exact times (was it 20 minute or 30 minutes or 16 minutes) between being left in the bath and found would be quite helpful to further prove a heart stoppage as the primary cause. Given that, it would have been difficult to resuscitate her." -"Myocarditis is a disease marked by inflammation and damage of the heart muscle. Although the exact incidence of myocarditis is not known, it is estimated that several thousand patients per year are diagnosed in the United States. Myocarditis usually attacks otherwise healthy people. It is believed that 5 to 20% of all cases of sudden death in young adults [and especially children] are due to myocarditis." -"Most cases of myocarditis have no symptoms and are only identified by an electrocardiogram or by blood tests that detect heart injury." -"Because myocarditis is rare, the best way to diagnose and treat the disease is not known, but research is being done." - "The most common symptom of myocarditis is shortness of breath during exercise or exertion. This symptom usually develops 7 to 14 days after a viral illness and can progress to shortness of breath at night, which may require that you sit up to breathe. Other symptoms may include fatigue, heart palpitations and chest pain or pressure. The legs also may swell. Rarely, myocarditis causes a sudden loss of consciousness that may be due to abnormal heart rhythms. In summary, patients may experience some, all or none of the following symptoms: shortness of breath, chest pain, lightheadedness, irregular heartbeat, sudden loss of consciousness." - "The majority of cases of myocarditis have no symptoms and are not diagnosed." - "No lifestyle changes or medical treatments are known to prevent viral myocarditis." - "Because myocarditis is rare, information is limited regarding its causes and effective treatments. Myocarditis is not believed to be inherited. No genes are known to predispose people to myocarditis." - "A wide variety of infectious diseases can result in myocarditis, including viruses, bacteria, chlamydia, rickettsia, fungi, and protozoa. Viruses are most often the infectious disease found to cause acute myocarditis. " From what I have read from this site and other sources, is that myocarditis most often presents itself like a cold or flu...which is why it is so difficult to diagnose. And, even when a concerned parent has taken their seemingly "flu-ish" child in to the doctor, they have most often been sent back home with instructions to treat them for the flu (this is all what I have surmised from different testimonies of people who have lost someone from this). Then their child died and, like us, did not receive an understood reason for it for many months. So how often do you over-react and take your child in because of a cold or flu?? Yeah. Rarely to never. Even though there are survivors, I have read that it has a remarkably high mortality rate. The word "frustrating" does not even cover it. Tragic, huh? In the beginning I had angrily said that "it's as if God just stopped her heart" ....seriously, it seems as if that was true! *Please forgive my poor job of quickly compiling this research...I don't have much time to write a "report" like I might have in college many moons ago. But I hope this provides some insight for those who, like me, had never even heard of this! All of my friends have been afraid of baths ever since Vienne passed...now, unfortunately, everyone is going to be afraid of the common cold or flu. I am so sorry. **Oh, and those of you who know more than I do, feel free to correct me on here. Though, if you do, please be gentle. ***How about a video to end this on a lighter note?? hhmm? I wanted to correct the fact that my friend is not head of pediatrics at OHSU, as I had been told by someone, but rather, an MD in Pediatric Intensive Care at OHSU, I believe. Nonetheless, a trusted resource and I am thankful for his input. For me, this takes the onus off God and is confirmation that we live in a fallen world (as a loved one said at one point), a world full of illness and disease, a world in which our bodies are less than perfect and susceptible to such. This myocarditis is elusive. We can't know what to do to prevent it! That is desperately frustrating...and scarey. Just like so many other things...cancer for one. We think we can beat it by diet, the things we expose ourselves to in our personal environment, etc, etc. But the truth is, it too, is elusive and creeps into the healthiest bodies and situations...evidence of this fallen world we live in. Yes, I still cry out daily...and I mean ALL through the day under my breath..."why, Lord Jesus? It hurts so much." And I yearn for what we have lost, desperately, gut-wrenchingly. So, again and again, I have to continually shift my gaze to eternal truths, knowing I will be with my Vienne someday soon, free of this "tent" of despair, as will you, my daughter. May you be encouraged with this my sweet girl. I love you...to China. You know how to make me cry Jules. So sorry for this loss. And glad you're getting some information. Some answers. Praying that as you process the weight of the grief begins to lift little by little. So glad for an eternal perspective. Love you both. 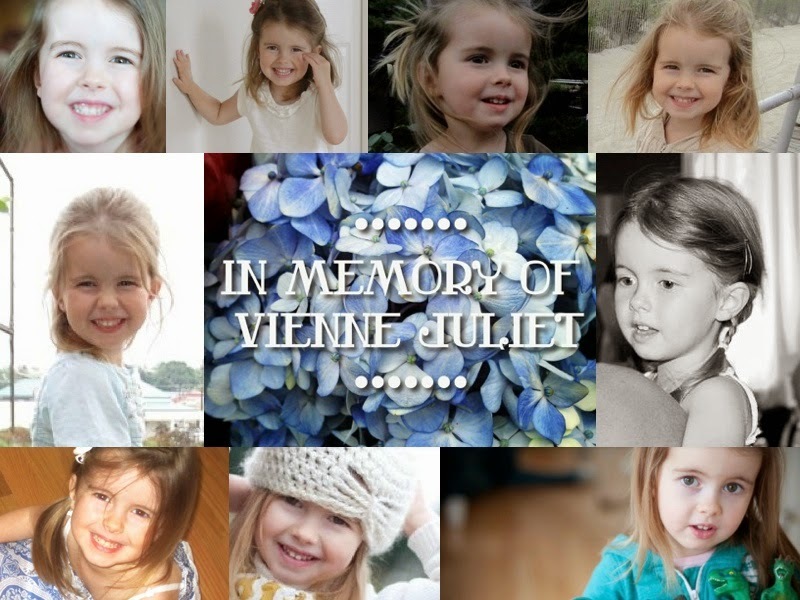 Hi Jenny, thank you so much for continuing to share Vienne's story. I have shed many tears for your loss but love reading about her life. This might sound weird, but thank you for letting us in on your pain. It is hard to read, but a good hard. A make you think about your life hard. I had a dream about Vienne (kinda embarassing to admit since you don't even know me!) but she was sitting on my best friends lap (who passed away from the same thing) in heaven and she had on a white dress and she was waving and smiling. Again, thank you for sharing a piece of her life with us. Oh, reading this makes me so sad, but in a way it makes sense....more sense than just falling over dead for no reason. I hate that you have to research this. I hate it all and that we live in this world of sickness and flaw. Thank you for letting us walk through this with you. It hurts so so much, I can only imagine the unbearable amount of pain you feel daily. I feel the hurt deeply and know it is only a fraction of what you are feeling. I am grateful for your friendship, my dear friend. Love you so. Prayers always with you. Thank you for sharing your research. It just confirms the story you shared earlier, about the angels who fought over sending the perfect child to earth, and God's plan was to send her for a short bit, then bring her back to Him. He did just that. I love that video. Such joy. So fun. I love how she says Elliott. I love her.